Aurrigo has joined forces with Jaguar Land Rover to fit ‘virtual eyes’ to its autonomous pods to understand how humans will trust self-driving vehicles. Pedestrians and cyclists struggle to trust self-driving cars, but Jaguar Land Rover believes it may have a solution: ‘virtual eyes’ that stare at fellow road users, letting them know they’ve been seen. Aurrigo has joined forces with Jaguar Land Rover to fit ‘virtual eyes’ to its autonomous pods to understand how humans will trust self-driving vehicles. The friendly-faced ‘eye pods’ have a vital job: helping work out how much information future self-driving cars should share with users or pedestrians to ensure that people trust the technology. Self-driving cars will make “eye contact” with pedestrians to give people more confidence to cross roads.Jaguar Land Rover has fitted virtual eyes to driverless pods in a trial to boost trust in the vehicles, which two thirds of pedestrians fear may be less safe. 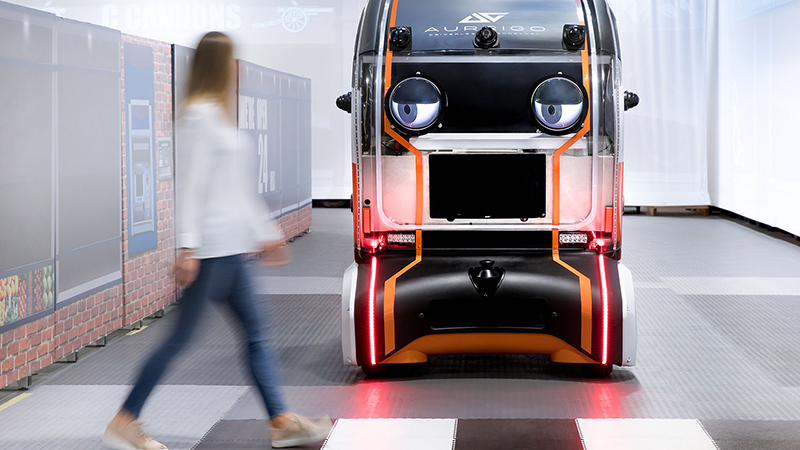 Jaguar Land Rover has enlisted the help of some unconventional looking new employees – googly eyed autonomous pods, which are being used to gauge how pedestrians behave around autonomous vehicles. The funny looking eyes are actually a vital component of the pods, as determining how much information autonomous cars should share with human pedestrians is the key goal of the study. British carmaker Jaguar Land Rover is testing a robot that catches your eye as you cross the road. The self-driving pods, which feature large “virtual eyes”, are being trialled in Coventry to try to increase humans’ trust in autonomous cars. Interest in new vehicle Aurrigo’s pod is receiving interest from corporates (pic: Terry Murden) A driverless car was among the big attractions at a breakthrough technology conference in Edinburgh. The pod can carry four passengers at a top speed of 15 mph and was available for those attending the Disrupt 2.0 conference to take free rides along a short lane on RBS’s Gogarburn complex. Take a test ride from the metro station to the exhibition hall and hear first-hand how we can help you join the autonomous transport revolution. Self driving pods are set to change the way we transport people efficiently on the last stage of their journey from transport hubs to and from a wide range of destinations.